The Chamber is delighted that its New England Enterprising Women program - which brings women from business, academic, agriculture and other sectors together to support each other's other’s professional growth - will continue to grow, with thanks to support from the Greater Building Society. 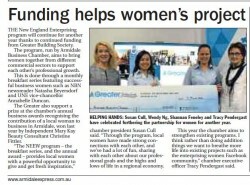 The Greater has renewed its funding for a second year to support the New England Enterprising Women (NEEW) program. NEEW includes a monthly breakfast series and an award at the annual Chamber Business Awards, recognising the contribution a local woman is making to the region. The breakfasts are usually held on the third Tuesday of the month. Recent speakers have included: NBN Newsreader, Natasha Beyersdorf; Tamworth-based artist Marie Larkin; (then) CEO of Best & Less, Holly Kramer; NSW Farmers’ president, Fiona Simson; and UNE’s vice chancellor and CEO, Prof Annabelle Duncan. “The NEEW program – the breakfast series, and the annual Award – provides local women with a powerful opportunity to give and get fresh inspiration,” comments Chamber President, Susan Cull. “Through the program, local women have made strong connections with each other, and we’ve had a lot of fun, sharing with each other about our professional goals and the highs and lows of life in a regional economy. “On behalf of the Armidale Business Chamber, I thank the Greater for their continued investment in, and partnership with the Chamber in the NEEW program. With the Greater’s support, we will be able to continue developing this group as a fantastic, dynamic network that supports and encourages local women’s achievements,” Mrs Cull said. Greater Building Society Armidale branch manager Wendy Ng said the funding comes from funds set aside by The Greater when it merged with Armidale Building Society to spend strengthening the New England region. She said The Greater is a customer owned banking organisation that has been helping New England people for more than 40 years. “As we are owned by customers not shareholders, our focus is always on our customers and the community they live in,” Ms Ng said. “The Greater want to help women’s financial literacy and support them to play a key role in the economic and social changes required for sustainable development of our region,” she said.